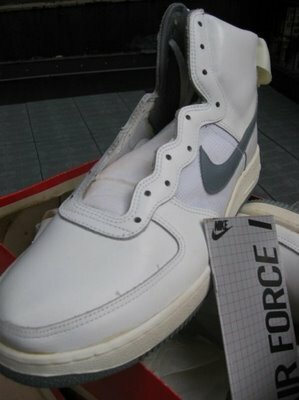 I posted few months a go a 1982 wear-sample of the original vintage Nike Air Force 1. 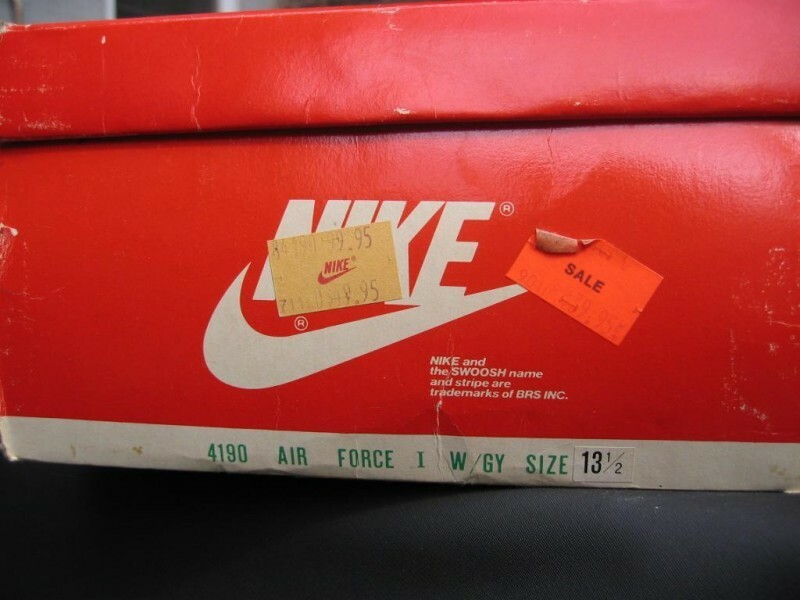 Now we go a little further in posting some pictures i found on niketalk.com of a fresh and deadstoick pair of original (i guess) 1982 Nike Air Force 1. I do not know who owns the shoes, but this is crazy heat… the mesh sidepanels, and the clean silver grey swoosh and soles… a grail for a lot of vintage collectors…. The name is a reference to Air Force One, the plane that carries the President of the United States. The shoes are sold in three different styles. The two most common are low-top and mid-top, while Nike produces a high-top model which is usually harder to find in many stores. The mid-top and high-top Air Force 1’s come with a velcro-securable strap; the mid-top strap is secured to the shoe while the high-top’s strap is movable and removable. Although the shoe comes in many different colors and color schemes, the most common Air Force 1’s sold are solid white (often referred to as “white-on-white”) and solid black colors. The Air Force 1 was produced in 1982 and discontinued the following year. It was re-released in 1986 with the modern italic Nike logo with a Swoosh on the bottom on the back of the shoe. 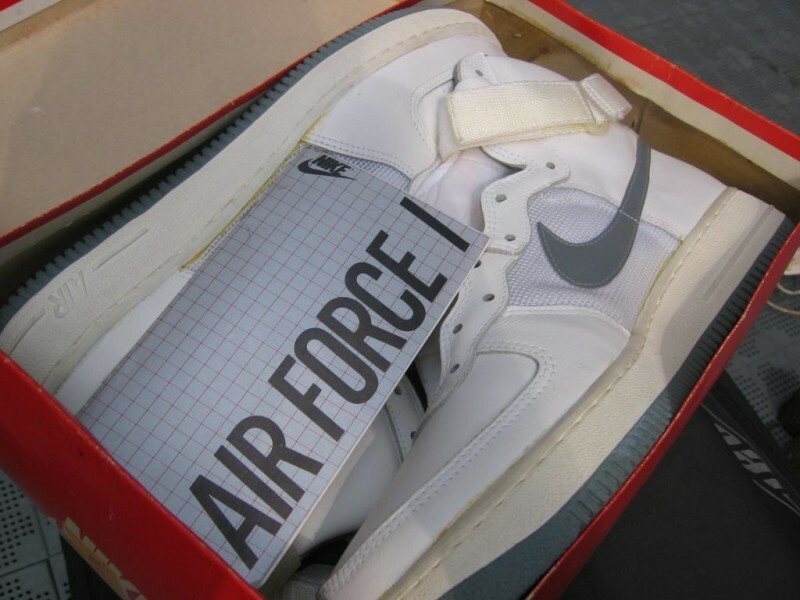 Little has changed to the Air Force One since its creation in 1982, although the original stitching on the side panels is no longer present in modern versions of the shoe. Since then, over 1,700 color variations have been produced, bringing in an estimated 800 million USD/year in revenue. The selling of the Air Force Ones online by certain retailers is prohibited by Nike who has restricted supply of the sneaker. Nike Air Force 1s were originally considered the favored shoe of inner-city youth, then hip hopstreetball players. Rappers Nelly his group, St. Lunatics collaborated on a 2002 single entitled “Air Force Ones” about the shoes. As a performance shoe, the AF1 is still used for street play as well as for professional play. NBA players Rasheed Wallace and Jerry Stackhouse have used AF1s for games before.